Behavior: What happens as peregrines age? Question: What happens as peregrines age? Does it affect how many eggs the female lays or how many of them hatch? How long do they live? 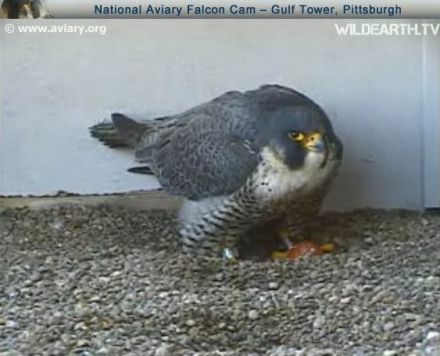 Answer: This year (March 2010) the female peregrine at the Gulf Tower (Tasha) was 14 years old, possibly older. In other words, a 14 year old female peregrine will not lay as many eggs as she used to. Some of her eggs won’t be fertile, some of the fertile eggs won’t hatch, and she won’t produce as many fledglings as she used to. In 2008, Tasha laid 4 eggs but only 2 hatched. In 2009 she laid 5 eggs but only 2 hatched. Weakness in an aging peregrine will eventually become evident to other peregrines. If the bird has a prime nesting location, a younger peregrine will try to take its territory and will eventually do so. In the spring, the challenge is often a fight. At other times of the year, the older peregrine may disappear (die) before the new one arrives. The maximum life span of peregrines in the wild is 16-20 years. For comparison, the maximum life span of humans is 105-122 years. The majority of individuals in both species die before reaching maximum age. Peregrines are highly territorial and will not easily abandon their long held territories. When an aging peregrine disappears from its territory is likely to have died. Thanks for the info Kate. We’re all very grateful. It’s sad to see one of our own growing older. But thanks for helping us understand. I have been showing the webcams to my students and they are really enjoying watching Dorothy and Tasha. The action at Tasha’s nest is very interesting to the kids and they get all excited when she sits on her nest for a little while. They have asked me a couple questions that I can’t answer. Could you please tell me when Dorothy eats and her age? We have never seem the male bird around her and have watched in between all of our classes. It is obvious when E2 and Tasha are around. We have seen them together several times. Thanks for taking your time to respond! Dorothy & E2 are the pair at the Cathedral of Learning and have 5 eggs. They have a very stable life – no excitement this year. If you watch closely you’ll see E2 come to relieve her of nest duty & sit on the eggs. He is 1/3 smaller than she is so he has a hard time getting them all under his belly. The camera is so close at Pitt that you can’t see that E2 is near the nest. At lunchtime I saw him perched near the nest, but not “on camera.” Dorothy is 11 years old and is probably in her prime since she laid more eggs than ever. E2 is 5 years old. Tasha & Louie are the pair at the Gulf Tower where there are only 2 eggs and no one is incubating them. They are not at the nest much since last weekend. Something mysterious is going on, perhaps a challenger. Louie comes on the scene occasionally and sits on the eggs but only for a short time. Tasha is 14 years old. Louie is 8 years old. Thanks for responding. I teach 4th and 5th grade. The kids think Tasha is being a bad mother by not sitting on her eggs. I explained what you posted about not incubating them until all the eggs are laid. Do you think that since she is an older bird that might have something to do with it? Do you have an approximate date as to when Dorothy’s eggs might hatch? We won’t want to miss that! Sorry for all the questions. If there is a better place for me to post, please let me know. Thanks again for your time! Tasha is not being a bad mother. We think she has been confronting a challenger. The nest is more important to her than the eggs. She can lay more eggs if she keeps the nest. Dorothy’s eggs will begin hatching on or about April 19th — maybe earlier, maybe later. Thank you so much for the information. All that you have provided has been wonderful. I was very sad to read about Dorothy. No, no! Dorothy is not the sad one! She is the one with 5 eggs at the Cathedral of Learning. Tasha is the female peregrine with the sad story who used to nest at the Gulf Tower. I got confused. This is the first time I have followed either bird and it is a bit confusing. I think I have it all straight now. I am sure my kids at school will be saddened to hear about Tasha. Do you suspect she is dead? The Cathedral of Learning the camera is always looking down on the peregrines because the area of the nest is so small the camera has to be positioned quite close. You can always see all the gravel (the flat area of the nest). At the Gulf Tower the camera looks straight across at the birds. It’s a straight-across view nearly at the level of the gravel. In both cases the birds can be perched quite close but out of view of the cameras. Kate, do you know anything about Peregrine Falcons in NY area? particularly in Mineola/Carle Place area. I’ve seen Peregrine Falcon about 5-6 times, have taken photos. At same place I’ve seen Red Tailed Hawks many times, but Peregrines came here just 5-6 times…. Also, Today, 6/12/2010 I had a RTH come very close where I live, after I took photos, I noticed, Red Tailed One didn’t have tag…Is it usual for Red Tailed Hawks? There are many nest sites on the coast of Long Island near NYC and even one in the interior, but I don’t know Long Island well enough to tell where that dot south of Glen Cove actually is.